In 2012, we introduced a "value added" product for card collectors that has proven to be very popular -- our exclusive Near Complete Sets. Since many collectors enjoy the challenge of building their own sets, we wanted to give you a way of obtaining most of the baseball cards in a set at a more reasonable price and then let you build the rest of the set on your own. 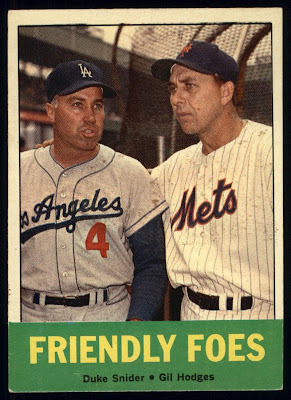 But you also can click here to find baseball card Near Complete Sets for other years in the 1950s and 1960s. 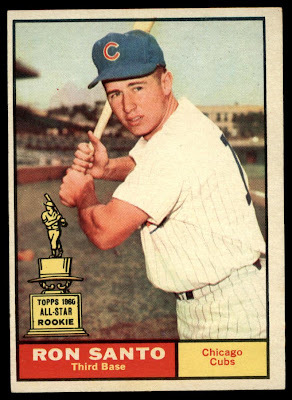 Ron Santo from the 1961 Topps Near Complete Set. Depending on the year and the grade, our Near Complete Sets consist of 60%-80% of the baseball cards you would get in a Complete Baseball Card Set. This leaves collectors like you plenty of room to go in and individually purchase the last 100-300 cards in the set. The best feature of our exclusive Near Complete Sets is the discount. While most of our Complete Sets are priced at 20-30% off of our individual card prices, our Near Complete Sets are priced even lower. Our Near Complete Sets are priced so that you receive 35%-45% off of the individual card prices. Duke Snider and Gil Hodges from the 1963 Near Complete Set. Dean's Cards Near Complete Sets are a great way to get a majority of the cards in a particular set for just a fraction of the cost. Our Near Complete Sets are custom built by hand by our team of baseball card grading professionals to give you a consistent grade. For collectors who shy away from purchasing complete sets because they like the challenge of finding and buying the cards individually, Near Complete Sets are a fun challenge -- and a great value. Please click here to see the Near Complete Sets we currently have in our online inventory. 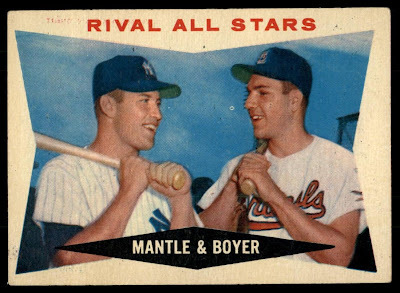 Mickey mantle and Ken Boyer from the 1960 Topps baseball cards Near Complete Set. And if you are looking for a Near Complete Set from a year that we currently don't have available online, please Contact Us and we will try our best to accommodate your specific needs. Here at Dean's Cards, we’re always trying to think up new and unique products to bring even more fun to the baseball card collecting hobby, and Near Complete Sets have proven to be very popular for our customers. Labels: Baseball Cards, collecting baseball cards, complete baseball card sets.